Jerry Dean Hinsley was born on April 9, 1945 in Hugo, Oklahoma. The right handed pitcher was chosen by the Pittsburgh Pirates right out of high school in New Mexico. 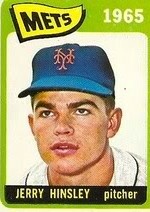 He spent 1963 on the bench in the minor leagues at the young age of 18. 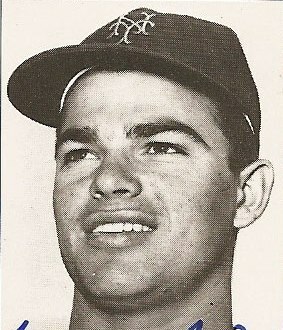 He was selected by the New York Mets as a Rule V draft pick in December 1963. He debuted with the Mets in April 1964 as a reliever against his old Pirates team. Roberto Clemente greeted him with a two run triple, although he did not take the loss. In his first start in May the St. Louis Cardinals tagged him for four runs by the third inning, that time he did earn his first loss. His next start was no better, as the San Francisco Giants got him for three runs at Candlestick Park. His last outing of the year was a loss to the Houston Astros in relief on May 23rd. He was sent back to the minors pitching there for the next two seasons. In 1967 he was 5-5 at between AA Williamsport & AAA Jacksonville getting another two game call up with the Mets in September '67. Hinsley would never make it to the big leagues again, pitching in the Mets & then the Cleveland Indians organization through 1971. Lifetime he was 0-2 with a 7.08 ERA with 14 strike outs 11 walks in eleven appearances.